Hello again, challenge this month, which is the second time that I participate in the facebook group Cantinho das Cozinheiras this month was Ana Manuela Dias Jorge.It took me several days to pick a recipe but last Sunday I ended up doing this tenderloin with part of the recipe Ana create, she is cook in the pot but I did in the oven and she leave skin on the potato I took off. I used almost all the ingredients of Ana recipe that she invented the so says the blog and I used as reference. I hope you like it, it was delicious !!! Beginning wash potatoes, peel them and left them in half. Break off the onion and cover tray bottom. Put meat in the center available chips and throw all the ingredients over the potatoes and meat. Bake for 2 hours 180 degrees. 1:30 First use silver paper (foil) to cover the entire tray to protect the meat and potatoes without burning. And very easy to practice and tasty. 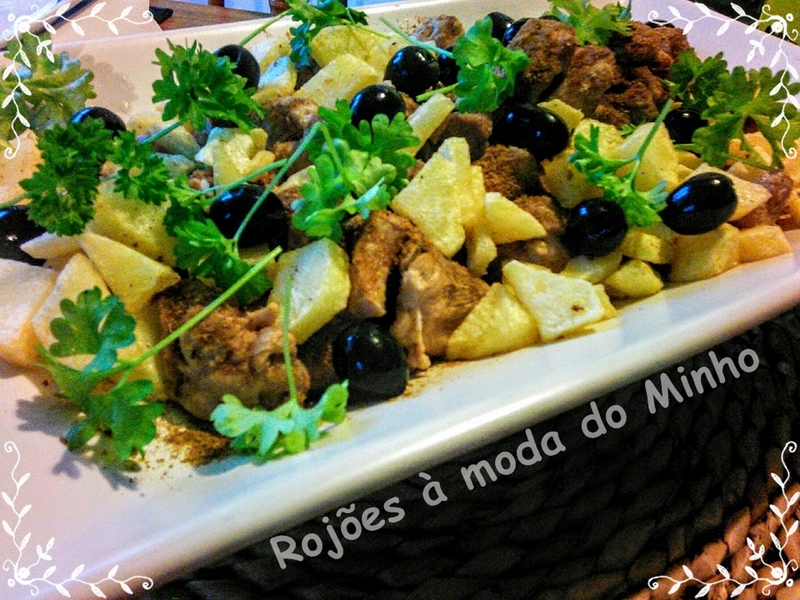 Hello, today i bring to blog this new recipe thats is delicious and just rigth for the summer. Shashlik (Шашлык) is a type of shish kebab commonly found in Russia and the former Soviet republics. It was likely brought to Moscow from Central Asia in the 19th century. Today, it’s a popular summer food cooked over an open fire at social gatherings. It’s traditionally prepared with lamb,chicken, pork, and beef variations are becoming increasingly prominent. With summer in full swing throughout the country right now, I thought it would be a great time to share this tasty dish.Shashlik prepare by lithuanian people they use mayo or greek yoghurt and i did with mayo. Unwrap and wash the pork shoulder. Begin cutting it into 1.5” strips, following the grain of the muscle whenever possible. Remove the bone as you cut. Continue to cut the meat into cubes that are roughly 1.5” on a side. Add a single layer of pork to a large pot (at least a 2 gallon pot). Add a layer of onions and some of the sauce. Continue adding layers of meat and onions until all of the meat is in the pot. Allow to marinade for at least 12 hours before cooking. or gas grill would work nearly as well. Skewer similarly sized pieces of pork on skewers, periodically wrapping some of the sliced onions between pieces of meat. Grill slowly until fully cooked. You could check the internal temperature of some of the pieces (145 degrees), but the easiest way is to just check for firmness of the pieces and then cut one open.You want the meat to be mostly grayish, but a little gray pink is ok.
remove them from the skewers and place them in a bowl. Enjoy them the Russian way by eating with your fingers! 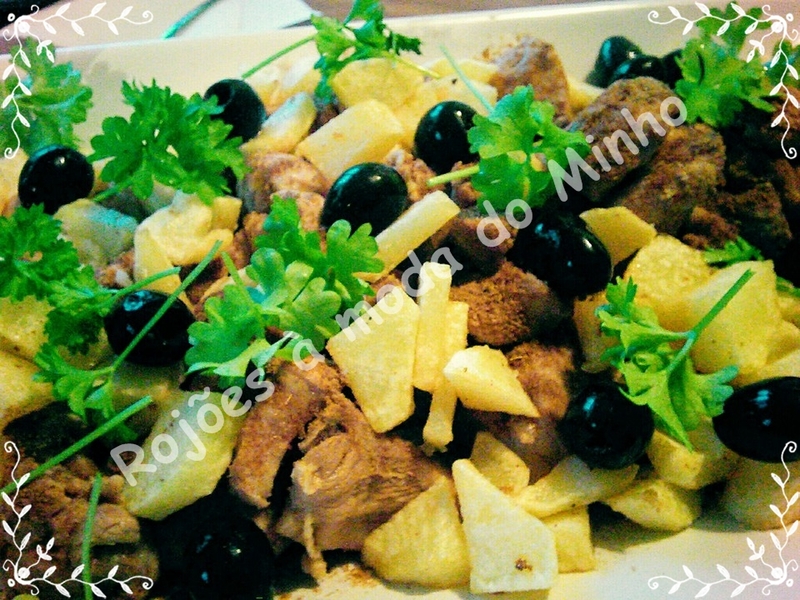 Hello , this sunday i bring new recipe to blog , roasted sunday i choose pork this time and portuguese touch with good white wine. I like to use white wine in any roasted even in fish, the white wine always give delicious flavour on food . Pour the potatoes and the meat in a baking tray, season with the remaining ingredients and bake at 200 ° C until golden brown and bake. In my oven takes about 60minutes. Remove and serve with a salad or white rice. I Marined the prok with wine, paprika, lemon, salt, pepper and bay leaves from the day before. With any meat i do this process but when is lamb, i wash whole piece of lamb with lemon and leave 2 days to marinate.